China's lunar lander has beamed back stunning images from the far side of the moon. Chang'e-4's 360° lens captured the Yutu-2 - or Jade Rabbit 2 - rover in front of the grey moonscape and reveals the potholed surface and barren expanse of land inside the the mysterious Von Kármán crater at the lunar south pole. 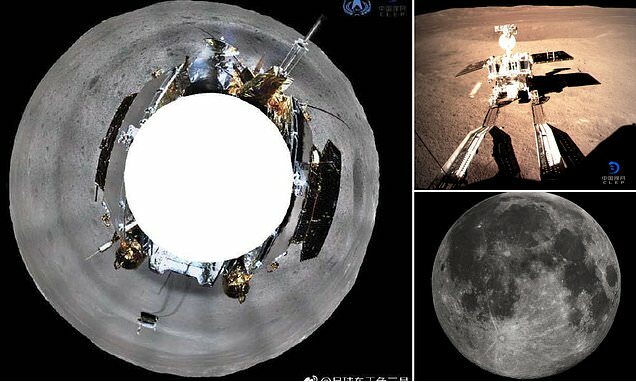 Pictures posted on Chinese social media also reveal Chang'e-4, and its rover, Yutu-2, have taken images of each other. This celestial photoshoot gives an astonishing look at the tandem of cutting-edge machinery which China is using to explore the previously unknown region. Eternally immortalised tracks left from Yutu-2's maiden voyage away from Chang'e-4 on January 4 can also be seen snaking over the untouched surface. Jade Rabbit 2 entered 'nap' mode after the initial landing in order to survive the blistering 200°C (390°F) lunar daytime which lasts for 14 Earth days. It was stirred from its forced slumber yesterday as the brutal temperatures subside ahead of the transition to a 300-hour-long lunar night. Footage has also emerged of a first-person look at the final approach of Chang'e-4 as it completed its pioneering landing on the tempestuous terrain of the South Pole-Aitken (SPA) Basin, the largest and deepest impact crater in the solar system. Chang'e-4, the Yutu-2 and the Queqiao relay satellite that beams data back to Earth are all 'in a stable condition, and all work was carried out as planned,' the statement concluded.